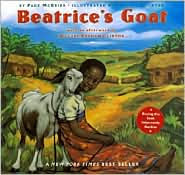 Beatrice's Goat is an inspiring book by Page McBrier, with beautiful illustrations by Lori Lohstoeter. Set in a small Ugandan village, this is the true story of Beatrice and her peasant family. In Beatrice's village, the only children who may attend school are the ones whose families can afford the required books and uniforms, things well out of reach of most of the villagers. It is the gift of a goat--a goat they call Mugisa (Luck)--from people in a far away place, that changes everything for Beatrice. It is a truly moving tale about how "one child, given the right tools, is able to lift her family out of poverty." Beatrice Biira, a 2008 graduate of Connecticut College, is the poor Ugandan girl in this book. Growing up impoverished in Uganda, Beatrice didn't have many options. But through the goodwill of some children in Niantic, Connecticut, and the aid group Heifer International, Beatrice was able to achieve a life and education she never dared to dream possible. Read more about it in an Op-Ed piece by Nicholas D. Kristof. I'm going to have to look this one up. Of course, I might get homesick. LOVE, love, love Heifer International anyway. Heifer Project is a great organization, I actually spent a summer in Perryville, Arkansas volunteering at Heifer Ranch. What an uplifting story--I am definitely going to have to find this book! Wow, we could start a Heifer International Fan Club! It's true, they do some fantastic work. Ruth, how great that you spent time volunteering with them! That must have been really fun and very gratifying.